After presenting 5 concerts in Los Angeles, we are changing our location for the next installment of the Improvisatory Minds concert series. This will be our New York City debut concert at St. Peters Church in Manhattan, on September 18th, at 7:30 PM. Our guest composers will be Alan Broadbent and Billy Childs, as well as Improvisatory Minds regulars Bevan Manson, Ed Neumeister, Michael Patterson and Gernot Wolfgang. He is currently associate artistic director to ‘HEAR NOW – A Festival of New Music by Contemporary Los Angeles Composers’ and artistic advisor to the Beverly Hills International Music Festival. BEVAN MANSON has received commissions from the San Francisco Symphony, First Night Boston, Sierra Chamber Music, and L.A. Chamber Orchestra violist Victoria Miskolczy. Bevan recently wrote and conducted string arrangements for saxophonist Gary Smulyan at NYC’s Blue Note. Chatter Chamber Concerts in Albuquerque presented his new piece for French horns and piano in 2013. His California Concertino for Flute and Chamber Orchestra was premiered by Katherine Fink of the Brooklyn Philharmonic, and also performed by L.A. Chamber Orchestra flutist David Shostac with the Brentwood-Westwood Symphony. Regarding a recent recording of the piece with Sara Andon and the Hollywood Studio Symphony, Fanfare Magazine commented that it “spins out a lovely melodic line…appealing… clear American pastoralism”. The Washington Post called his Piano Quartet “powerfully polyrhythmic”. He has performed with George Garzone, Gunther Schuller, Howard McGhee, and many others. ED NEUMEISTER has received commissions from all over the world from solo to chamber, jazz bands and orchestra and has received a Grammy Award Nomination, Commissions and Awards from ASCAP/IAJE, the Aaron Copland Fund for Music, National Endowment for the Arts and Meet the Composer. All Music Guide has called him, “one of the finest of his generation, an underrated giant waiting to be discovered.” Billboard Books said he is “a living legend”. A long-time member of the Vanguard Jazz Orchestra, he currently is a faculty member at the University of the Performing Arts in Graz, Austria. He is the founder of the NeuHat Ensemble in New York, an 18-piece hybrid ensemble, and ENJO (Ed Neumeister Jazz Orchestra) in New York and Los Angeles. As a leader, he has recorded seven albums. MICHAEL PATTERSON– he is a Grammy (2010) and Emmy Award winning composer. Commissions include the London Symphony Orchestra, NYRO, New Mexico, Utah and Sichuan, (China), Symphony Orchestras. 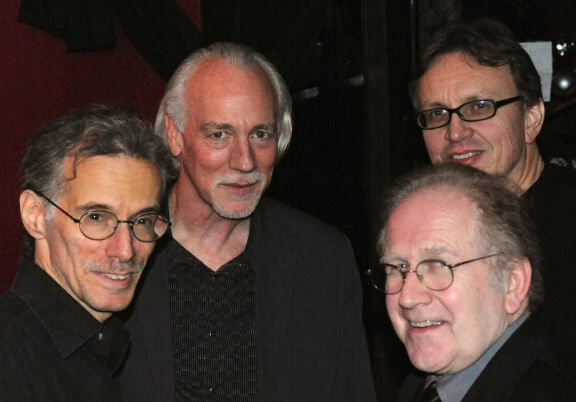 Artists he has collaborated with include Eddie Daniels, Rick Van Matre, Debussy Trio, Bob Sheppard and Marc Copland. Film and TV scores -The Adventures of Young Indiana Jones, J.A.G. (CBS-TV), Tiny Toon Adventures with Spielberg, and Lucasfilms’ Radioland Murders. Recent CD’s as producer, arranger, and composer for IPO recordings –Vol. I: The Music of Thad Jones –One More- Vol. II: The Summary. Mean What You Say and Homecoming with Eddie Daniels; Our Delight, Moody 4A and 4B. BILLY CHILDS-Childs has garnered ten Grammy nominations and three Grammy awards: two for best instrumental composition (Into the Light from Lyric and The Path Among The Trees from Autumn: In Moving Pictures) and one for best arrangement accompanying a vocalist. Most recently in 2013, Childs was awarded the prestigious Doris Duke Performing Artist Award. In 2009, Childs was the recipient of a Guggenheim Fellowship and in 2006 was awarded a Chamber Music America composer’s grant. As a pianist Childs has recently performed with, among others, Yo-Yo Ma, Sting, the Los Angeles Philharmonic, the Detroit Symphony, the Kronos Quartet, Wynton Marsalis, Jack DeJohnette, Ron Carter, the Ying String Quartet, the American Brass Quintet, and Chris Botti. In January 2010, The Detroit Symphony (Leonard Slatkin conducting) premiered Childs’ Concerto For Violin And Orchestra with Regina Carter as soloist. Upcoming projects include a new piece for Duke University composed for his Jazz/Chamber Ensemble featuring Dianne Reeves and the Ying Quartet and a recording for Sony Masterworks: a re-imagining of the music of Laura Nyro. ALAN BROADBENT-In 1969 he was asked to join Woody Herman’s band as his pianist and arranger for 3 years. In 1972 he settled in Los Angeles, beginning a musical relationship with the legendary singer Irene Kral (no relation to Diana Krall). Soon he was also invited into the studio scene as a pianist for the great Nelson Riddle, David Rose and Johnny Mandel. In the early 90s he was asked to be a part of Natalie Cole’s famous “Unforgettable” cd, at which time he toured as her pianist and, a little while later, as her conductor. Shortly after, he became a member of Charlie Haden’s Quartet West, touring the festivals of Europe, UK and the USA. It was while with this group that he won his second Grammy, an orchestral accompaniment written for Shirley Horn of Leonard Bernstein’s “Lonely Town”. As a soloist and with his jazz trio, Broadbent has been nominated for Grammys twice for best instrumental performance, in the company of such artists as Herbie Hancock, Sonny Rollins and Keith Jarrett. In 2007 he was awarded the New Zealand Order of Merit, an honor he holds in high regard. Broadbent is Diana Krall’s conductor for her occasional orchestra concerts and is the conductor on her “Live in Paris” DVD. Recently he has been the arranger on Glenn Frey’s cd with strings, “After Hours”, and wrote six string arrangements for Sir Paul McCartney’s “Kisses On The Bottom” with the London Symphony. He has just returned from solo piano concerts in the UK, Poland and France. It has been his lifelong goal, through his orchestral arrangements and jazz improvisations, to discover, in popular music and standard songs, deeper feelings of communication and love.